What do charter schools, school choice and the NAACP’s call for a moratorium on charter schools across the nation mean for minority communities? Join Roland S. Martin, Kevin Chavous, and Courtney English for a special town hall focused on educating our youth. 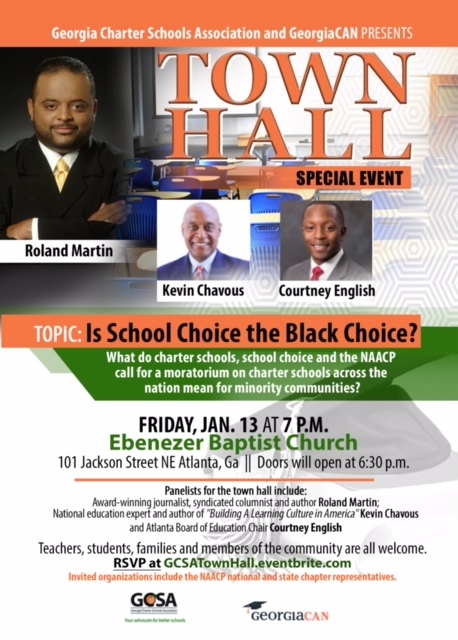 The next installment in the Is School Choice the Black Choice town hall tour will be held Friday, January, 13th at 7PM at Ebenezer Baptist Church. 101 Jackson Street NE Atlanta, Georgia. Teachers, students, families, and members of the community are all welcome. Visit http://schoolchoiceistheblackchoice.com/ for more info about educating our youth.